WhistleWatch Diagnostic device FEV1 (Forced Expiratory Volume) for home use. 5,000 people visit the emergency room due to asthma every day. 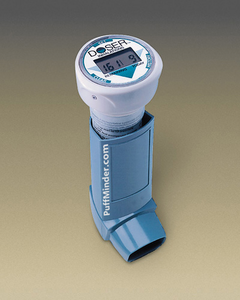 PuffMinder: Metered Dose Inhaler (MDI) / Dry Powder Inhaler (DPI): At www.PuffMinder.com we offer patients a selection of PuffMinder™ inhaler reminder devices to help you or your patient never forget to take your ASTHMA / COPD / Anti-Inflammatory / MDI / Dry Powder Inhaler medications again. Asthma Prevention Medications Every Day. Rescue inhaler (puffer) only when you need it!